Editor's note: This article is the second in a three part series excerpted from Yamaguschi's classic karate text, "Goju Ryu Karate Do Kyohan: The History and Fundamentals of Goju-Ryu Karate," now in reprint. Previous articles in this series were "The History and Fundamentals of Goju-Ryu Karate. "and "The Significance of Kata." First, there has to be a certain distance. Even though you have a strong attacking technique, if the distance is too far, the attack can fail. Kumite is the combination of attack and defense, therefore, a one-sided performance is useless. The timing has to match the opponent's movements. When you use techniques in attacks and defenses in an actual fight, you have to have kime-waza [timing] when you attack consciously. In the game, this is the technique to gain the point. For the technique to be effective, your mind will have to be enriched and it appears outwardly in your kiai (shout). When you proceed with your techniques, speed is needed; however, if you attack or change position continuously and recklessly, you cannot make use of timing. For that reason, after you perform kime-waza (timing) as zanshin (continuing spirit), you have to leave some place in your mind to enrich your power. Yakusoku-kumite is the performing of movements against an opponent structured by the basics with an opponent by having the kind of techniques and the directions arranged in advance. It is decided by how many techniques the attacking side uses. It can be ippon-kumite [one-point kumite], nihon-kumite [two-point kumite], or more. The most basic techniques, which are standing, thrusting, and catching techniques, are used. It follows the basics, and both have the same standing position -- if the opponent has the right leg out in front, the other has the right leg out in front as well, or if the opponent thrusts with the right hand, the other catches his hand with his right hand. In yakusoku-kumite, the person who performs defense will use attacking techniques at the end. On the other hand, there is applied yakusoku kumite, in which the basic and applied techniques are structured promisingly for use in an actual fight. The number of techniques used are not limited in applied yakusoku-kumite; therefore, the number of structures are uncountable. Still, this is promised kumite and is usually performed by two people; however, there are practices in which three, four, or even more people perform what is called applied kumite. When applied kumite is practiced by many people, depending on how many are involved, the person on the opposite side will be indicated. Jiyu-kumite refers to the practice of using all the techniques you have learned until now against an opponent. You cannot be off your guard even a second. This is a very serious training method. If you do it for enjoyment, you can get injured. Jiyu-kumite is not designed for deciding victory or defeat. It is the practice of offense and defense with the development of the techniques. You can not improve if you always think about victory. As a matter of fact, you should not excite (or stimulate) your opponent more than needed when you practice kumite. You have to respect any opponent you have when you practice. Instantaneous kyo. Right before the opponent changes to the next movement. Right after the opponent has made a movement that was not effective. When the opponent lacks harmony between the techniques used and his mind, during both attack and defense. When the opponent's mind is dispersed and is not really ready. When the opponent loses his balance when he makes a movement. Right before the opponent breathes in deeply. When the opponent is confused because of your movement. When the opponent is daunted by your tactics or ability. The unguarded moment in the mind. The unguarded moment in the spirit. The unguarded moment in the technique. The unguarded moment in the appearance. The unguarded moment in the act. (The same as in normal life, if you behave badly, you have to take responsibility for your actions.) If you use techniques that do not follow the rule, that is faulty. Usually, yakusoku-kumite is done by two people. One does the attack and the other the defense. Practice by repeating the attacks and defenses as the preceding stage of jiyu-kumite and shiai-kumite. I especially recommend to students who have a black belt, or who are more than third-dan, to practice yakusoku-kumite against two or three opponents, besides the one-on-one practices. Jiyu-kumite and shiai-kumite (contest fighting) are both practiced by two people. For that reason, some people interpret that the practice against three or four people is the art of self-defense, which is unreasonably emphasized in karate. However, the purpose of practicing is to build up your strength in kumite, and when you have many opponents, extreme reflexes are needed; therefore, you will improve changing your positions and the continuous techniques of uke (block) and tsuki (punch), technically and mentally. Editor's note: While Yamaguchi's portrayal of women in karate is not consistent with modern thinking in the west, his statements are interesting from a historical point perspective and show that he progressive in his thinking in a country once dominated by the male point of view. Karate-do is spreading rapidly among men. As yet, there are not many women who want to learn karate-do. 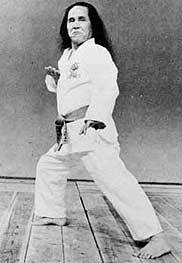 However, recently, some women who are interested in karate-do can be found here and there practicing in dojo. Few women are practicing karate with men, especially in foreign countries. There are classes just for women and more women are becoming interested in karate-do. In the practice of kata, you have to realize the importance of basics and have to remember them precisely. It is important to practice self-defense techniques with the attitude of passiveness. It is not the practice to twist men around your finger. There are many ways to defend yourself. It is how you judge to defend yourself when the danger comes suddenly that is important, and you have to cope with the situation calmly without panicking. There is a proverb that says: "Discretion is the better part of valor." Self-defense techniques for women is as the proverb says. In the explanation of the techniques, they appear from the uke (block) to the kime-waza, but if you have composure to throw down the opponent, it is better to run away rather than fight. Half-confidence is a big mistake. The important thing is not to go to a dangerous place, and avoid these troubles to begin with.